Mature resort-style landscaping, including towering palms, seclude the Helms family’s acre-plus view lot and create a resort-style ambience. Writer Kristin delights in the garden created by the home’s former owners. 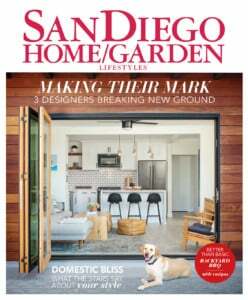 “The minute we walked in, we knew it was for us,” says writer and author Kristin Helms, who had been searching with her husband Mike, a commercial real-estate investment executive, for a larger home to house their growing family—two energetic preschoolers, Blake and Gavin, and their friendly golden retriever, Tucker. The home’s shutter-framed dormers, broad bay windows and brick accents brought back childhood memories for Kristin, who was raised in Sacramento, and for Mike, who grew up in Virginia. 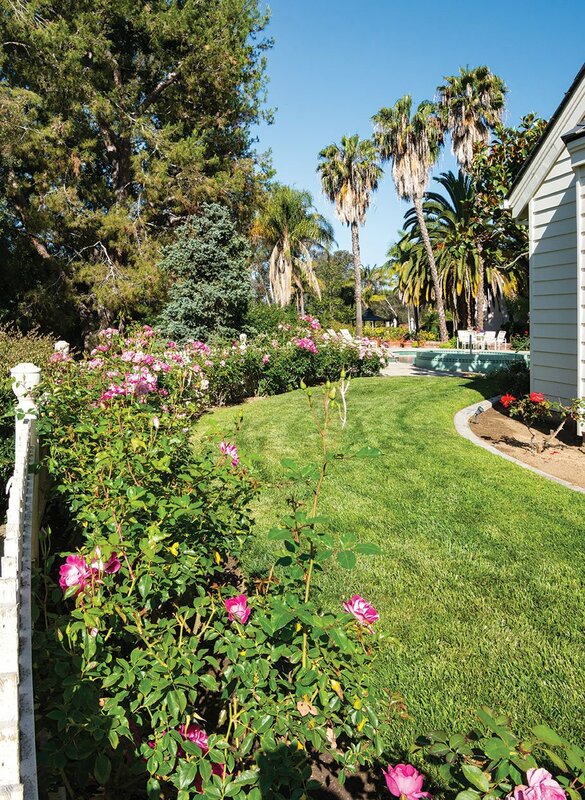 The resort-style pool and spa in the backyard, rimmed with flower-filled beds and sheltered by mature trees, also appealed to the couple, who had been living near the beach in Cardiff. “The house just felt like home—our forever home—where we want to raise our kids,” Kristin says. The pool and spa, steps away from the master suite, appealed to Mike and Kristin who moved there from a home just blocks from Cardiff State Beach. A hummingbird flits above a red star cluster bloom. Much of that landscape lives on today, to the delight of the Helms family. 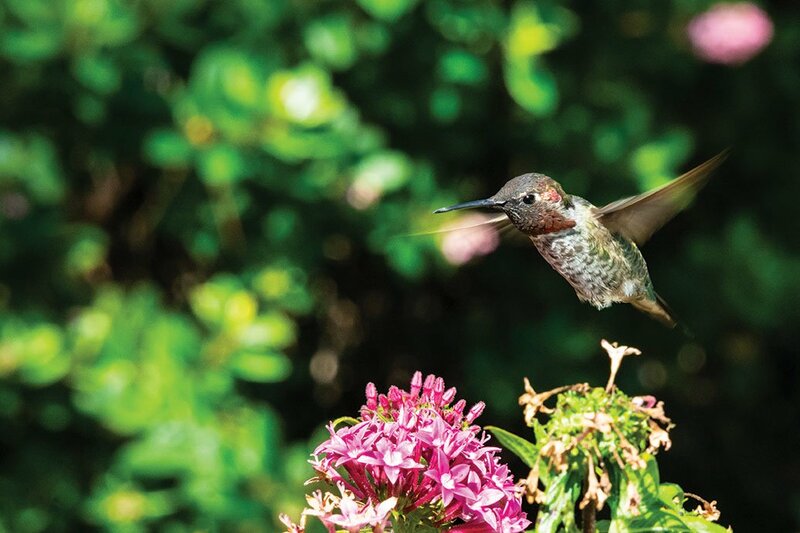 “We see her love of flowers, birds and butterflies all around us,” Kristin says. 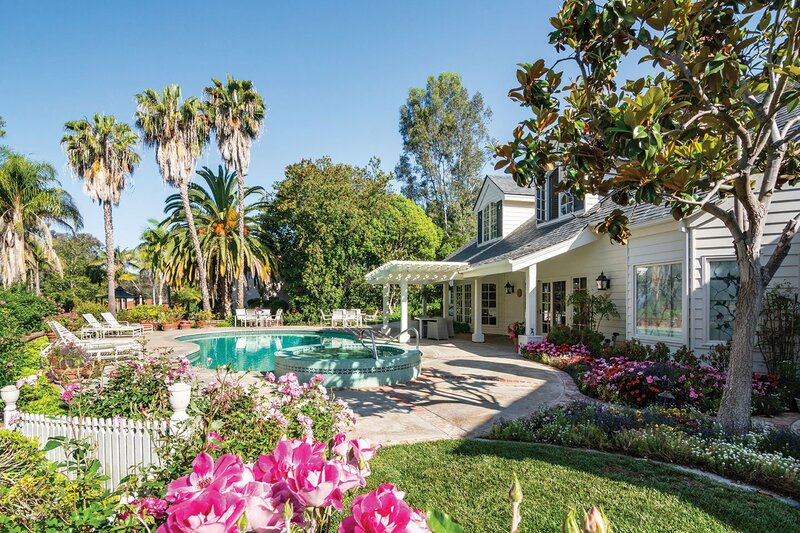 A Fairbanks Ranch home stirred childhood memories for Mike Helms, who was raised in Virginia, and his wife Kristin, who grew up in Sacramento. “It just felt like home,” says Kristin of the estate they purchased a year ago. A colorful border brims with flowers irresistible to hummingbirds and butterflies. 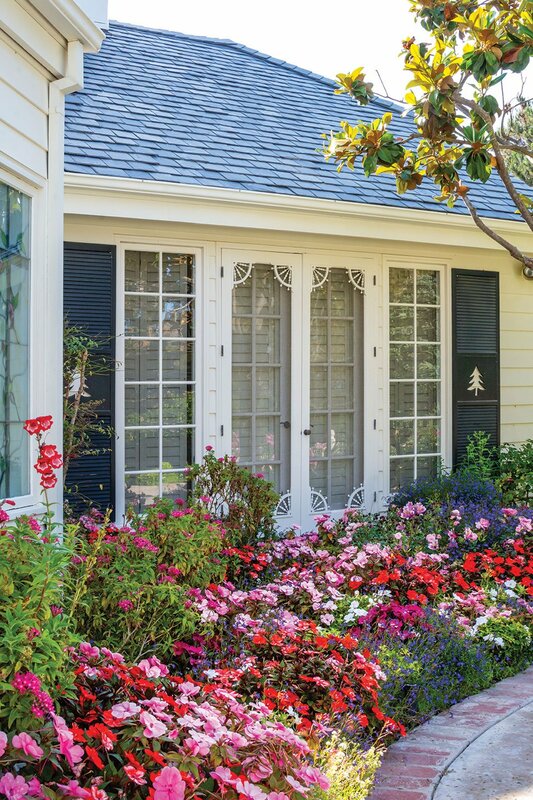 In every season, colorful blooms and foliage brighten the landscape starting at the brick-pillared entry. There, sculpted Indian hawthorns line a long driveway shaded by tall trees including five melaleucas, their dramatic trunks feathered with cream and brown bark. Closer to the house, the drive circles past majestic California sycamores that herald fall with golden color and purple-leaved flowering plums and blue-gray acacias that signal spring when they blossom. Flanking the front door is a classic shade garden fronted by a recirculating stream that tumbles over silvery cobbles and under the entry walkway before ending in a shallow reflecting pool. Here, bright pink azaleas, camellias and hydrangeas mound beneath striking tall tree ferns that brush the slate roof with their fronds. 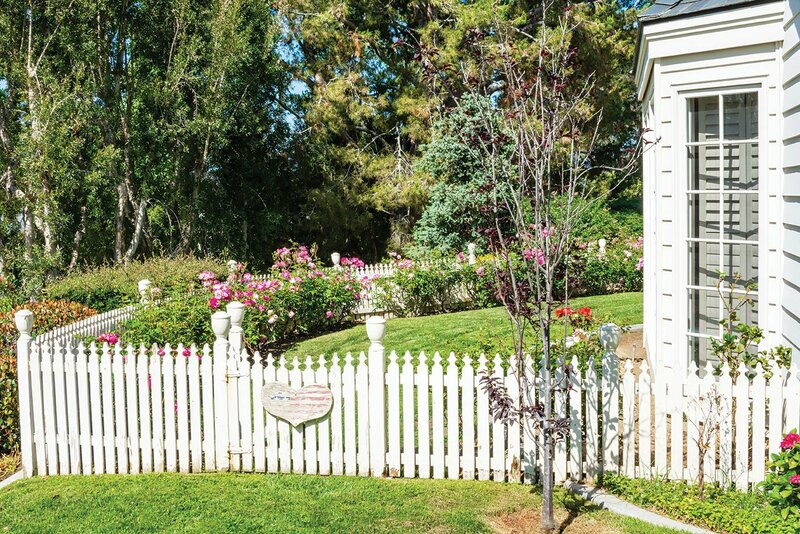 A weathered heart marks the entrance to an old-fashioned rose garden enclosed by a white picket fence designed by the former owners. Nearby, a white gate decorated with a rustic heart opens into a rose garden surrounded by a white fence Rae designed. 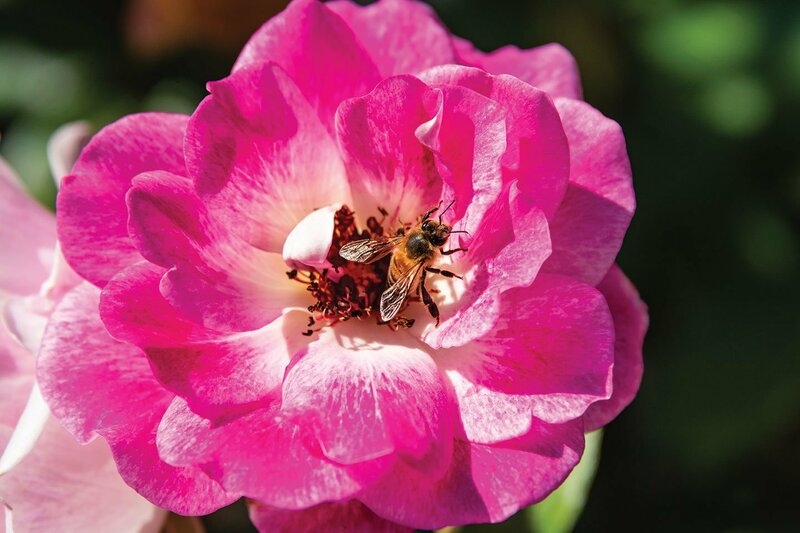 Shrub roses obscure the pickets year-round with bouquets of pink flowers, while across a swath of lawn, more rose bushes—some with arm-thick canes, their metal name tags long lost—bloom beneath the bay window in the master suite. 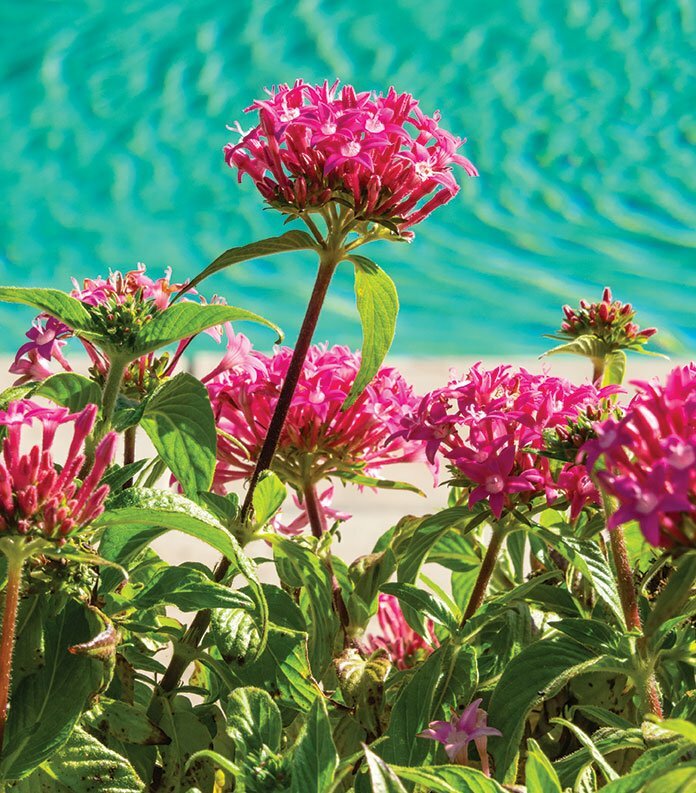 Red star clusters thrive in the backyard’s sunny beds. In the backyard, narrow beds between the pool patio and the house overflow with ferns and impatiens in the shade of a pergola, while sunnier areas blossom with red star clusters, a butterfly favorite, penstemons that lure hummingbirds, and frothy drifts of sweet alyssum and lobelia. Opposite the pool’s turquoise waters, where chaises call to sun lovers, beds of jaunty agapanthus punctuate a low-growing evergreen hedge and a trio of palms reach high into the sky. A walkway around the side of the house to the outdoor shower is studded with a variety of metal objects—medallions, keys, owl and turtle sculptures—another of Rae’s touches. “I suspect my mother bought them when she had an antique store,” Clay says. 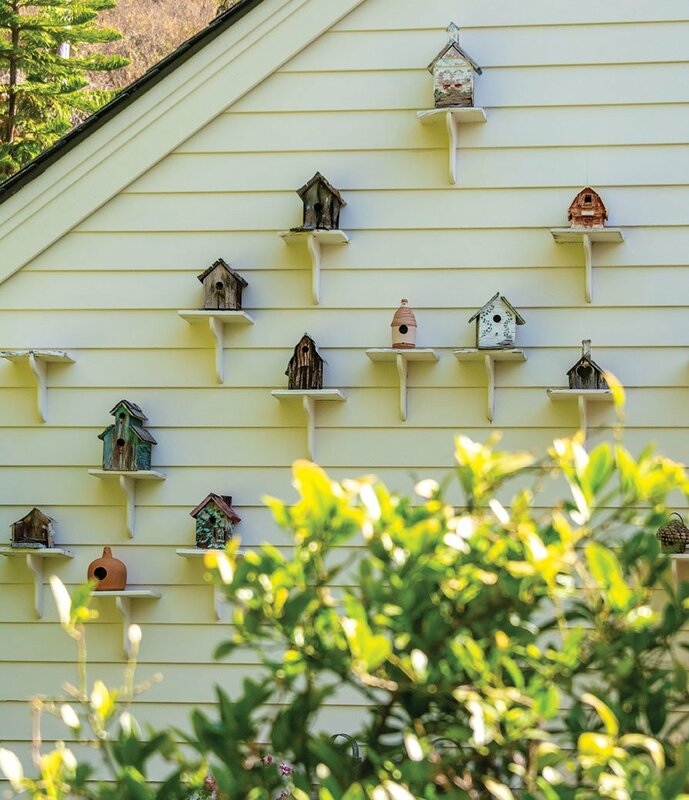 Birdhouses that dress a garage wall were collected by Rae who viewed them as a symbol of spring renewal. With the house update behind them, Kristin and Mike anticipate a similar refreshing of the landscape, perhaps adding a fire feature and replanting a long terraced bed. “We’ll keep the lawn—the kids love playing there,” says Kristin, gesturing to the toys jumbled on the grass nearby. Pink shrub roses that bloom much of the year march down a white picket fence. In the interim, she continues to expand a writing career built on modern motherhood that includes founding the online magazine Tribe and her first book, From Boardroom to Baby: A Roadmap for Career Women Transitioning to Stay-at-Home Moms. Her latest coffee table book of poetry and photography published by Dover Publication (due out in 2020) was drafted during quiet times in her home “writing den” that overlooks the front garden.